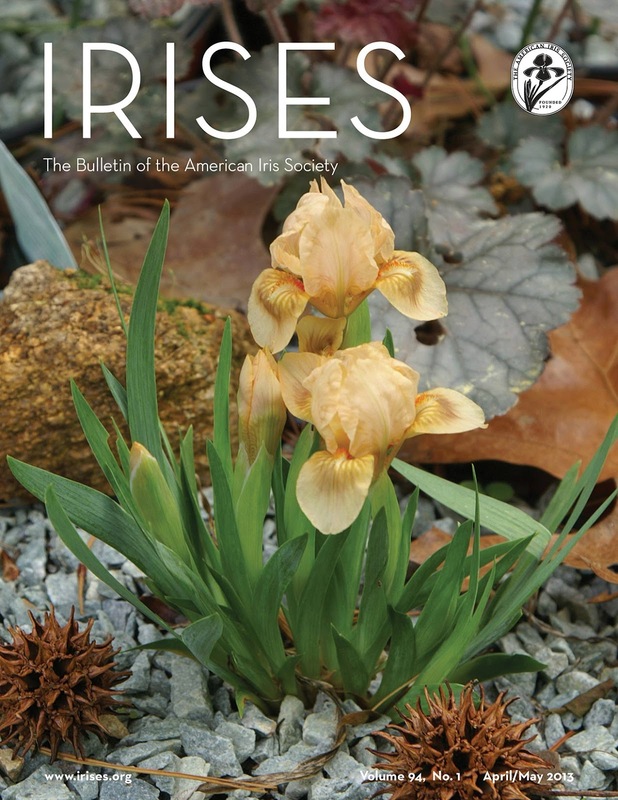 Whether you can grow them or even if you have never seen MDBs (Miniature Dwarf Bearded irises) in person, you will enjoy the beautiful cover selected for the current issue of "IRISES, the Bulletin of The American Iris Society." It has a gorgeous photograph of a 1993 MDB by Ben Hager called, 'Dainty Morse,' a lovely little thing, which will move you with its beauty and elegance. Be it because it's the spring issue, or just because, this edition is loaded with fascinating articles and if you're like me you won't be able to put this edition down until you have read it throughout. With a strong recommendation by Jerry: if weather changes is getting you down, grow Louisiana irises. For those new to The American Iris Society, as a member you will receive the printed edition of IRISES, or if you are an e-member, then you will be able to read the entire publication online. 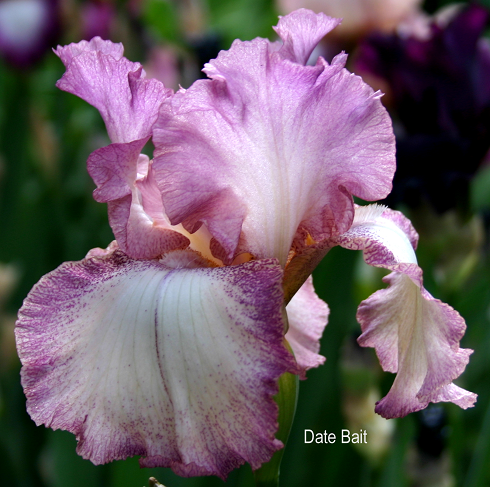 The latter is a very convenient option for overseas iris enthusiasts. For more information, please go to our website's membership information section. Printed editions are in the hands of the Post Office, the e-version is ready for view at its normal location online. 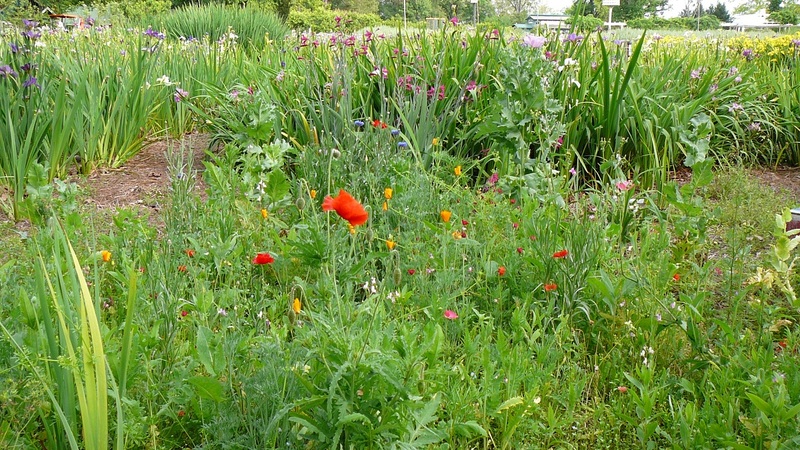 One of the first recollections I have as a child are those of my Grandma Holland's flower beds. She was a lover of flowers of all kinds, but had a special fondness for Tall Bearded Irises; I've inherited that passion. I spent many hours as a child watching her lovingly care for her prized hybrids. Now, years later, the scent of fragrant iris blooms in the spring takes me back to special memories. Their stately stalks, bearing colorful blooms of the rainbow, are a source of almost giddy happiness. Today there are so many new, beautiful seedlings from talented hybridizers, but I will always love many of the older varieties from the '70s and '80s--the ones from my grandma's garden. Their beauty, vigor, and proven reliability, along with good growth habits and form, make them timeless in my eyes. "LACE JABOT" (Gaulter 1982). This award-winning (HM 1985) lavender self, flushed blue-white in the center of the falls, is still a standout in the garden. The well-branched stalks show off the large, lacy blooms early in the season here. It is a long-lived bloom in arrangements. Another favorite from Grandma's garden is "DATE BAIT" (Meek 1985). A few of the things I love most about this lovely tall plicata is how it glows in the sun, as well as its lovely aroma and prolific growth habits. It is always one of the first to bloom in my garden. 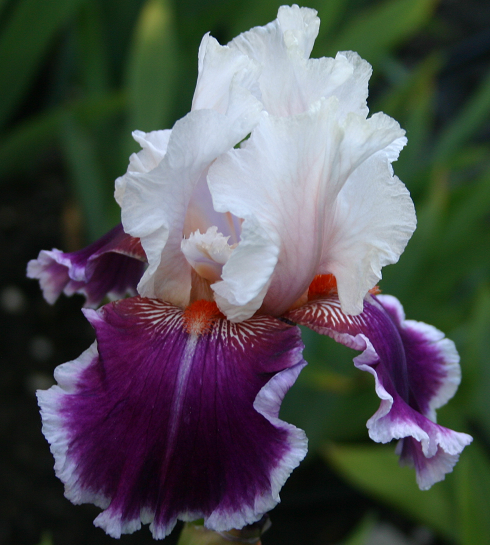 An iris that always gets noticed and is a favorite of visitors in the garden is "RINGO" (Shoop 1979). This iris photographs especially well, and blends with several perennials, making it a most desirable iris to put in your landscape. The contrasting white rim on the grape falls with the bright red beard is especially nice. Grandma had lots of plicatas, and one I remember most is "BEYOND" (Gibson 1979). The deep apricot-brown standards, and ruffled and fluted falls of a white ground stitched deep apricot, with bright orange beards is one I haven't seen in many gardens, but her large clump was something to behold! An arrangement of "BEYOND" is stunning. 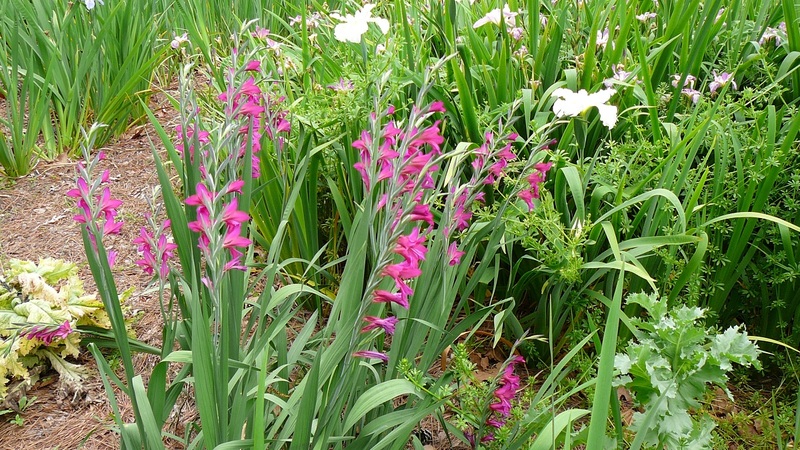 Grandma loved pink irises. 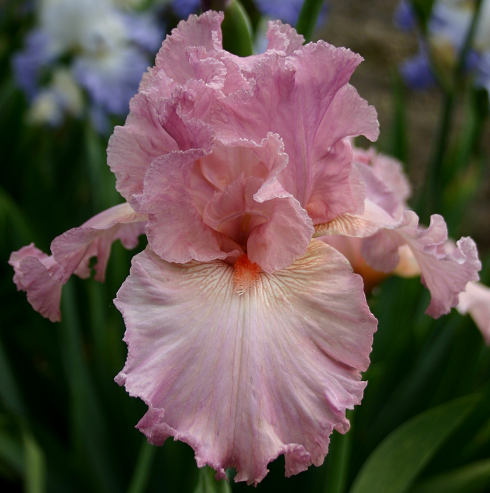 There were many pink Tall Bearded Irises in her garden--that's probably one of the reasons why pinks are so attractive to me. Two that have proven to be reliable and hardy in Northern Utah over the years are "PINK ANGEL" (Rudolph 1973) and "PINK SWAN" (Gibson 1984). I like the long, flowing falls, nice branching and ramrod stalks on "PINK ANGEL." It also makes an impressive clump. 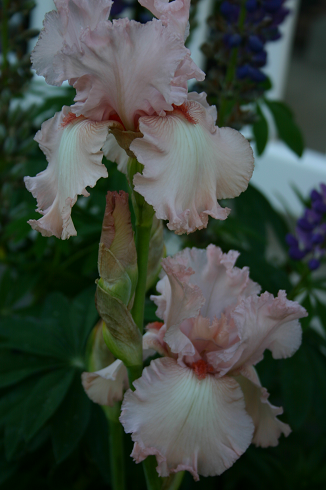 The blue-pink color of "PINK SWAN" with its unique red beards sets it apart from other pinks, making it an all-time favorite of mine. I like companion plants of dark blue lupine and delphinium to compliment the hint of blue on its standards. Plicatas were another popular iris in Grandma's garden, and "THEATER" (Keppel 1986) has established itself as a personal favorite for its excellent growth habits here in the top of Utah. It's light violet standards, and rounded pristine white falls, overlaid with dotted darker plicata markings make an excellent choice for a place you want to make an exclamation in the garden. The last three I'm going to mention are award-winning "SWEET MUSETTE" (Schreiner 1986), "EVER AFTER" (Keppel 1986), and 40" bright orchid "ELISA RENEE" (L. Gaulter 1983). These beautiful colored blooms are favorites not only for their dependability and beauty, but fuschia-rose colored "EVER AFTER" has a sweet fragrance as well. There are hundreds of wonderful irises from the '70s and '80s; these are just a few of my favorites. My grandma and her straight rows of beautiful Tall Bearded Irises are long gone, but as I work in the iris beds, or revel in a newly bloomed flower, thoughts of her and recollections of years gone by bring me joy and pleasant memories. 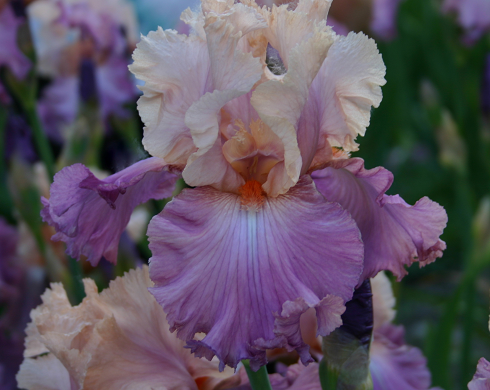 What are your favorite 'tried-and-tested' Tall Bearded Irises from the '70s and '80s? 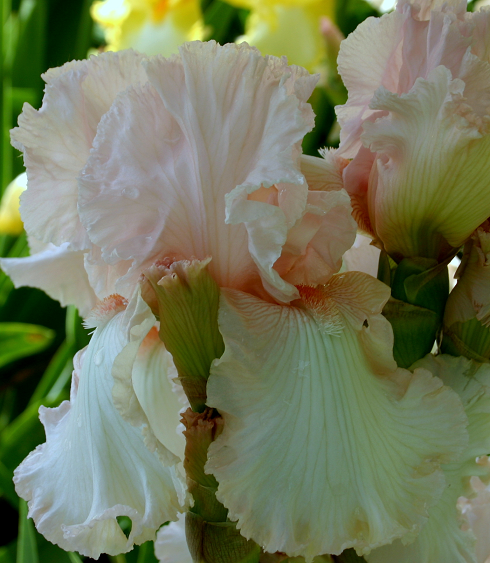 What special memories do irises invoke from your childhood? Spring bloom turned out to be very nice, even though we had an unusual April this year. After a really early spring last year, the year began normally enough, only for old man winter to return with a few exceptionally cold days and nights. Cloudy weather followed. We even had a couple of very late freezes that made it all the way to New Orleans. The poor irises did not know what to do. Just about the time things seemed to settle down, my wife Sue and I headed out to Dallas, Texas, to attend the American Iris Society convention, immediately followed by the Society for Louisiana Irises convention. The crazy weather followed us to Dallas and we experienced some cold and raining weather while trying to tour gardens. 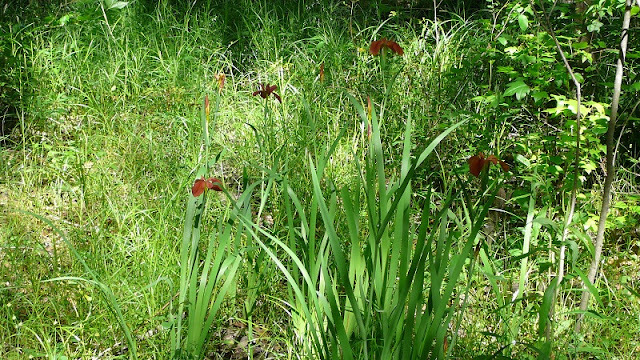 After a week and a half in Dallas, we returned to Northwest Louisiana and irises in bloom. 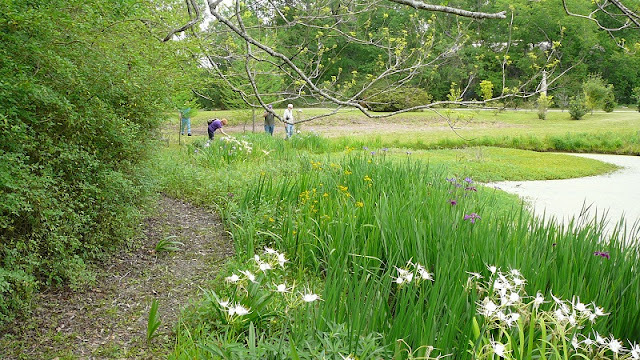 The next few weeks were busy with tours, photographing and marking off irises that had strayed from their beds. And here it is, already fall, and I finally found time to share some spring photographs with you. Usually I just take pictures of the irises to insure that the correct iris is in the assigned bed. Sometimes the irises in the adjoining bed will stray into a neighboring bed and bloom season is the only time to tell one iris from another. This year, however, I decided to also take quite a few "scene shots" of irises growing in the many locations here on Caddo Lake. 'Longue Vue' Dormon Haymon 1999 with Caddo Lake in background. I hope you have enjoyed the views. 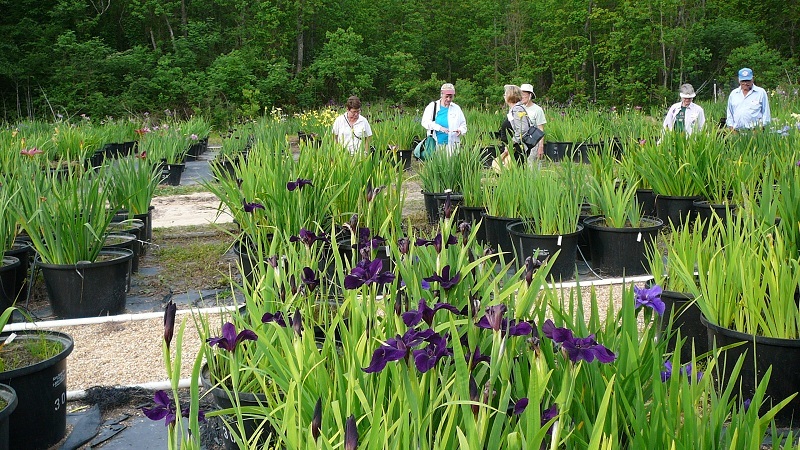 Learn more about growing Louisiana irises at the Society for Louisiana Irises website. For more information on Caddo Lake in NW Louisiana visit Caddo Lake website. For more information about the bald cypress trees in Louisiana just visit Bald Cypress Trees. Simply click on any of the links to view the information. When iris growers think of Louisiana (LA) irises, they often think of irises growing in swamps or at least in ponds ('tanks' in Texas). LA irises certainly like to grow in water and in their native environment they are often found growing in bodies of water. 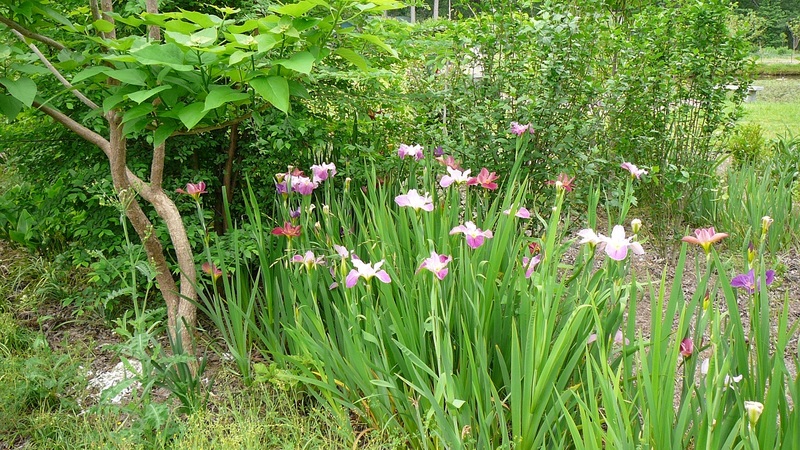 However, LA irises are perfectly happy growing with other plants. 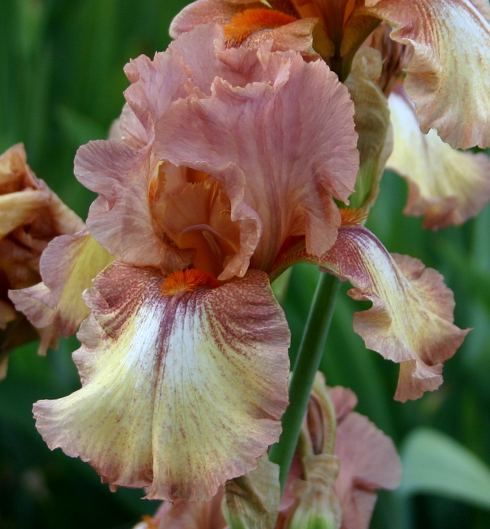 We grow them with tall bearded irises, with roses, with hostas and many different "wild flowers". You probably do not want to try to grow LA irises with your cacti but they are happy to grow with most other plants requiring a normal amount of water and sunlight. Below I have posted some pictures of LA irises growing in many different locations and with many different plants. 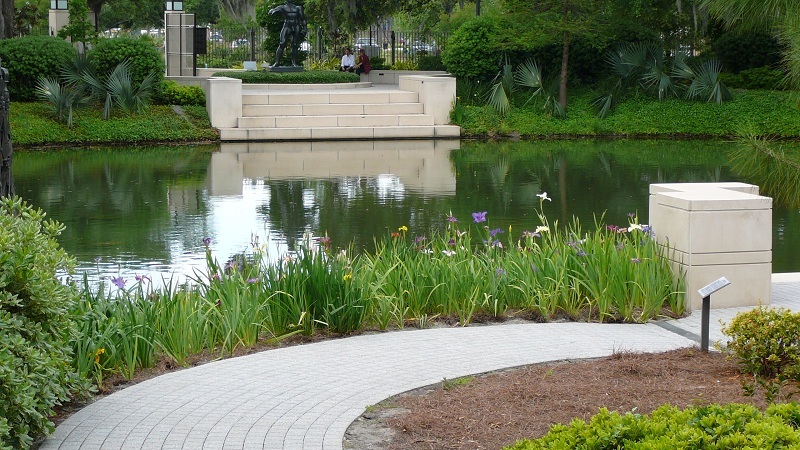 It you are ever in New Orleans, LA, in early April, be sure to visit the New Orleans City Park, especially the "big pond". Some of the pictures below show irises growing in City Park. Hope you enjoyed the pictures. 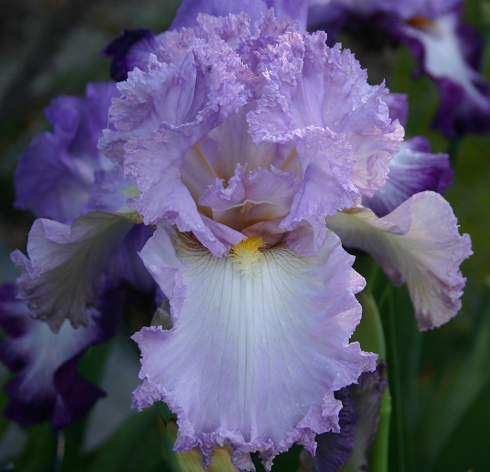 You can learn more about LA irises at the Society for LA Irises, and about many different kinds of irises at the American Iris Society website. For more lovely photos, visit the website for Longue Vue House and Gardens in New Orleans. Interested in knowing more about New Orleans City Park? Click the link. Now is the time to order your irises for next year. My mom Wendy passed the gardening gene to me, but I infected her with the iris virus. She is a master of color coordination, and her small flower garden is filled with violets, magenta-purples, pinks, peaches, and pale yellows. 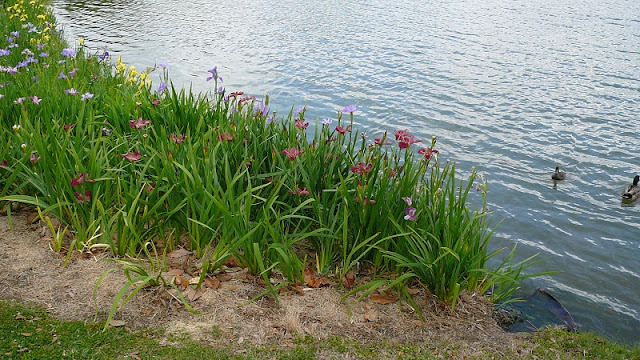 She has recently planted a number of reblooming irises, and a few have bloomed for the first time in her Southern California garden this year, and I thought you would enjoy seeing some first-rate reblooming irises used in coordinated beds. This is 'Violet Turner'. It blooms three times here in Southern California: in April, again occasionally in the summer if it's not too hot, and again in the fall. The colors are very intense and stand out well against greenery. Wendy has it planted with alstroemerias, 'Yves Piaget' (magenta) and 'Perdita' (pale peach) roses. Just on the other side of a small flagstone path is 'Mariposa Autumn', a prolific reblooming iris hybridized by Rick Tasco. 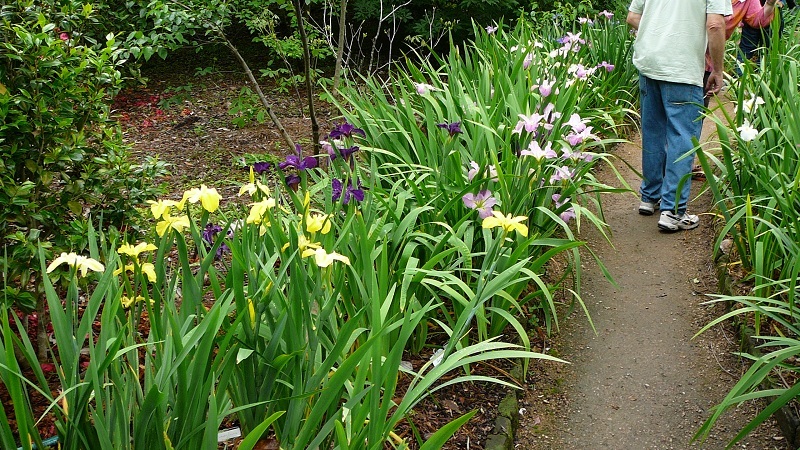 This iris stays short, which is perfect for the front of a border. 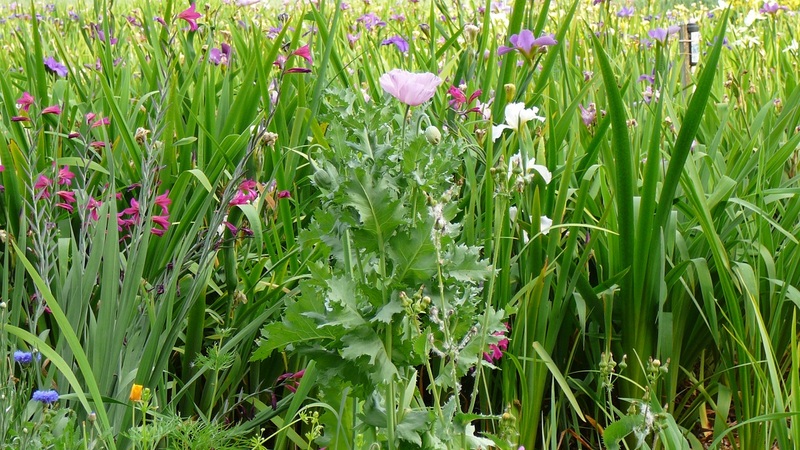 It blooms from late March through April, and then intermittently all summer, with a big flush again in the fall. Off in a corner with flax lily and ferns is 'Double Agent'. This is its first bloom, so we shall see how it does as a rebloomer this summer and fall. It has red-violet falls and goes well with the oxalis just emerging from winter dormancy. Over near an arbor, Wendy grows the rebloomers 'Cantina' and 'Total Recall'. 'Cantina' has rebloomed in the fall, but not prolifically like 'Mariposa Autumn'. 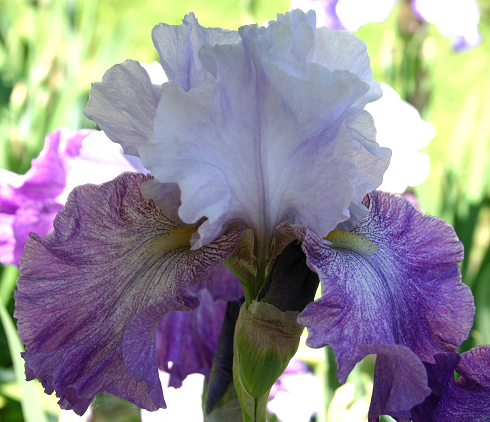 It's a fun iris to play with, and one year Wendy found violas in exactly the same colors. No luck this year, so she used purples instead. The newest reblooming addition to the garden is 'Tennison Ridge', which Wendy chose specifically to complement 'Darcy Bussell' and 'Twilight Zone' roses. It should be a spectacular clump by next year, when this new part of her garden grows up a bit. 'Tennison Ridge' reblooms very well here in the late fall. It is truly lovely when backlit. 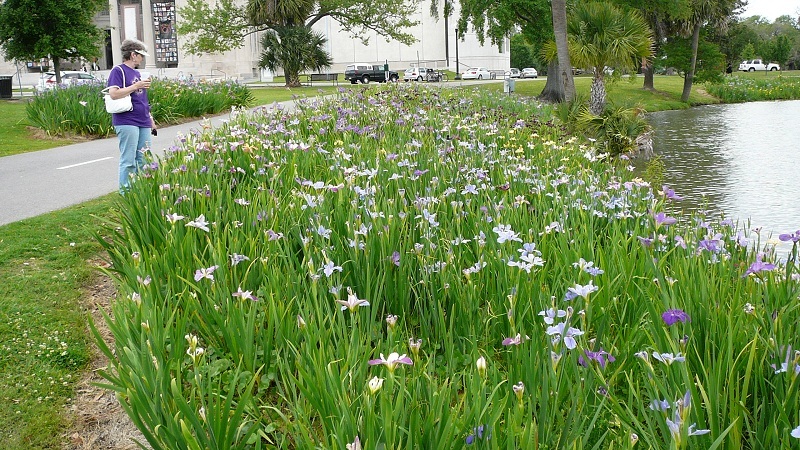 All of these irises were in bloom at the same time, in late April. They bloom so much they give the daylilies and the roses a run for their money. If you live in a warm climate that does not suffer from early frosts, you might consider growing some reblooming irises in your garden. 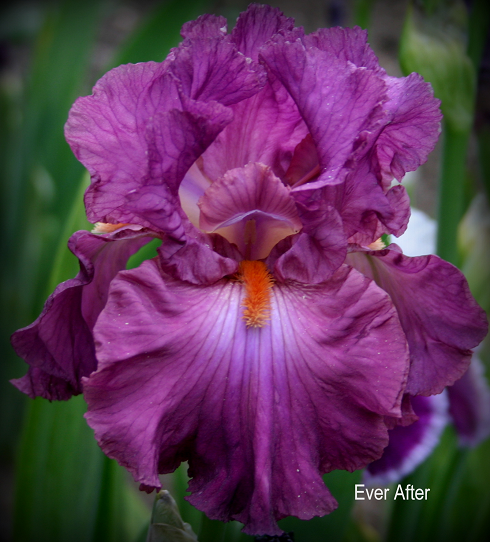 Do you grow any reblooming irises? Which are great performers for you? Please share in the comments section below.